Palma Cathedral, or Cathedral of Santa Maria of Palma, or as people call it “La Seu”, is a Gothic Roman Catholic cathedral in the island of Majorca, Spain. 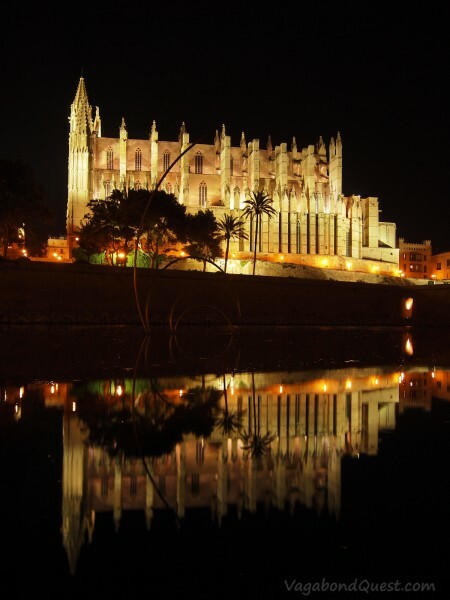 Sitting in one of the Balearic Island in the western Mediterranean Sea, the cathedral’s construction was started on the 1229, but not finished until 4 centuries after. Just like other typical gothic cathedrals in Europe, the size of La Seu is massive! With a length of 121 m and height of the nave 44 m, this cathedral made me feel supersmall being inside it. In the day time, you can visit the cathedral to see the greatness of the interior designs and the luxuriously creepy holy relics, including some saint’s bones inside decorated glass cases. At night, enjoy relaxing across the reflecting pool to see the perfect mirror image of this gorgeously illuminated cathedral on the water surface. It’s romantic. Damn that is a great shot… love it!!! Thank you!! Are you going to go to Ballearic? It’s a great cathedral. I visited the cathedral already more than 100 times as I am from Majorca but every time I visit it it looks different. I was surprised that (as resident) I had to pay an entrance fee the last time I was there in February of this year! What?! How come you have to pay?! It’s a great cathedral indeed, I’m glad we paid to get inside. I can still see in my head the Gaudi piece and the big bone relic. I have never really fancied visiting Majorca, but this shot could change my mind! Love night photos! I wish I wasn’t so scared about taking my baby out at night! Wow what a beautiful shot, I love the reflection! great photo! the reflections are awesome! so gorgeous pics…..”La Seuâ€, is a Gothic Roman Catholic cathedral in the island of Majorca, Spain. I would like to visit Spain to see this. While almost everyone travels to Mallorca for the sun and partying, there are plenty of historic and cultural hotspots worth seeing.